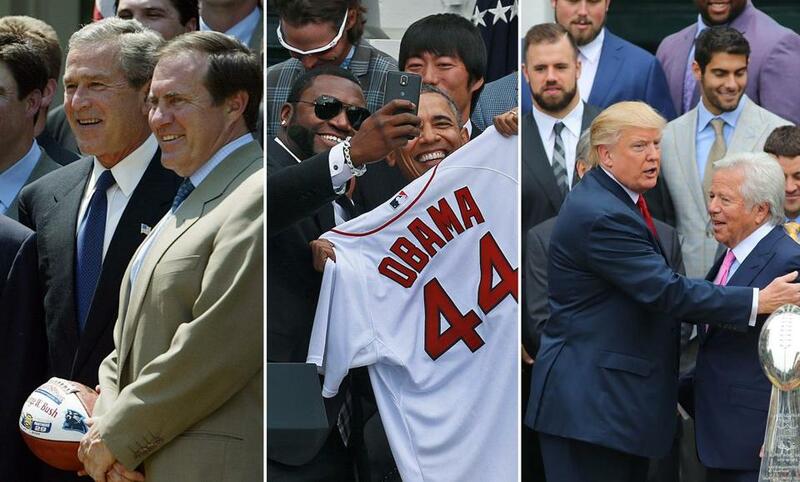 From left: George W. Bush and Bill Belichick in 2004; David Ortiz and Barack Obama in 2014; and Donald Trump and Robert Kraft in 2017. The confetti had barely fluttered to the ground after Sunday’s Super Bowl win in Atlanta, when the first New England Patriots player confirmed he would not be celebrating the hard-fought victory with the traditional photo op at Donald Trump’s White House. Boston’s last championship team, the 2018 Red Sox, is scheduled to visit the White House in May. If that comes off as planned, it will be without prominent players of color, including Jackie Bradley Jr., Rafael Devers, and Mookie Betts, the team’s best all-around player and the reigning American League MVP, who have said they will not attend. Pitcher Eduardo Rodriguez has said he is unlikely to go. Manager Alex Cora has been undecided. Led largely by prominent African-American athletes, such as NBA stars LeBron James and Steph Curry, an anti-Trump backlash has turned the traditional — and traditionally harmless and hokey — White House victory celebration into the new third rail of sports, a flashpoint in the broader debate over racial inequality and social injustice. Curry’s team, the NBA champion Golden State Warriors, has missed two straight White House celebrations. Last year’s Super Bowl winner, the Philadelphia Eagles, were disinvited by Trump after it became clear few players would attend. Last month’s White House visit by the Clemson Tigers college football champions made news for Trump’s decision to serve fast food because of the lack of staff during the government shutdown. Further reporting revealed that most of the team’s black players had skipped the event. After every major championship, questions fly around the winning locker room like three-pointers in a Warriors game: Who won’t go to the White House? Who will? Either way, a player’s choice is now scrutinized through a political lens, whether intended that way or not. What used to be a fun event is now a minefield for teams. Some are opting out entirely, publicly declaring they won’t go to the White House to ensure they won’t be invited, said Amira Rose Davis, a Penn State professor of history and women’s, gender, and sexuality studies. “There are women’s teams, in particular, that have been self-selecting out of it,” she said. Teams such as the 2018 WNBA champion Seattle Storm, which, upon winning the title, preemptively said they would not go to the White House to meet Trump. That history runs through activist and All-America football player Paul Robeson in the 1920s, to Muhammad Ali, to the iconic scene of US sprinters Tommie Smith and John Carlos raising gloved fists on the medal podium at the 1968 Olympics, he said. Extend the timeline a little further and it reaches Colin Kaepernick and African-American NFL players who took a knee during the national anthem to protest racial injustice. “Right now you have a megaphone coming from the White House that is being challenged by the megaphone coming from the athletic world,” Cooper said. The rise in social activism in sports, a trend magnified by social media, is partly because of the increasingly polarized political times. And partly, experts say, because of Trump. “You have what I think is a definitive blunder, a president who interjected himself into this wave of athlete activism,” Harry Edwards, sociologist and civil rights activist, said in an interview. In the 1960s, Edwards was lead organizer of the Olympic Project for Human Rights. The group’s proposal that black athletes boycott the 1968 Games in the name of racial justice failed to materialize, but the effort inspired Smith and Carlos to raise their fists. Edwards, 76, is now a professor emeritus at the University of California, Berkeley. In addition to making incendiary comments about minorities, Edwards said, Trump has also directly attacked black NFL players who protested during the anthem. “What amazes me more is you don’t have more athletes, black and white, who are not going, given the interdependence of athletes and the structure and culture of the locker room that it takes to win,” he said. It wasn’t always this way. Athletes — superstars, especially — used to skip the White House trip on occasion without any hint of politics, the way regular folks try to avoid unwanted obligations like jury duty. Celtics legend Larry Bird did not join his team at the Reagan White House, famously wisecracking, “If the president wants to see me, he knows where to find me.” Michael Jordan went golfing rather than visit with President George H.W. Bush. Jordan was accused of being selfish, but not political. One of Jordan’s teammates, however, three-point sharpshooter Craig Hodges, became a modern pioneer in the politicization of the White House championship photo op. In 1991, Hodges handed Bush a two-page letter calling for greater federal attention to inner-city issues and the plight of African-Americans. Hodges later claimed he was ostracized by the NBA for his outspoken nature, and his playing career ended the following year. In 2015, a “Make America Great Again” hat was seen inside the locker of Patriots quarterback Tom Brady, who said it was a gift from Trump. Brady missed the team’s 2017 visit to the White House for family reasons and also missed the ceremony during Barack Obama’s presidency in 2015. On Thursday, Brady brushed off an inquiry about whether he will celebrate his sixth Super Bowl win at the White House. “Next question,” he said, according to NBC10 Boston. After Hodges — and before Trump — a few notable athletes used personal boycotts to make explicit political points. Bruins goaltender Tim Thomas declined to visit the Obama White House after his team’s 2011 championship, saying he believed the federal government had grown out of control and was threatening the rights of the people. Two years later, Baltimore Ravens lineman Matt Birk skipped the White House visit amid Obama’s support of Planned Parenthood. At the time, those protests were outliers. But so long as Trump is in office, experts say, fans can expect White House boycotts to be as much a part of winning as a Gatorade shower.